A sequel aimed at children and a tearjerker will try to end July on a positive note. This week, we've added Cata & Dogs: Revenge of Kitty Galore and Charlie St. Cloud to the Long Range Forecast. Both films are set to hit theaters on July 30. It's been nine years since the first Cats & Dogs was released, which means that a good portion of the new film's target audience wasn't even born when the property was introduced. As a result, brand loyalty isn't going to be a major factor in Kitty Galore's financial performance. Still, the Warner Bros. release represents a comfortable choice for family audiences so its bound to post respectable numbers. The fact that it comes out more than a month after Toy Story 3 is also a plus. Zac Efron takes a turn into dramatic territory with Charlie St. Cloud, and if moviegoers don't have a problem shedding a tear or two after a summer full of explosions and one-liners then the Universal release should do pretty well. It certainly bodes well for St. 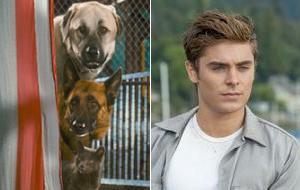 Cloud that Efron helped 17 Again become a $64 million domestic hit. The young actor seems to have a bright future ahead of him now that he's leaving his High School Musical beginnings behind. Check out our predictions for both films as well as others in the table below. Cats & Dogs: Revenge of Kitty Galore Jul 30, 2010 Warner Bros.